The process of teaching child to write numbers your child will develop many successful learning habits. Your child (Age 1 and half Year - 3 Years ) to begin with the basic learning like to sit, converse and eat on a dining table. Besides that the general academic like recognizing alphabets and numbers and learning rhymes also begin at this stage. Mom help to her child hold the Pencil to write Number. How to properly write numbers. By building upon the child's existing knowledge of numbers and slowly working up to writing with a pencil, you can teach the proper way to write their numbers. Look at numbers in print with your child, such as those on a number chart. Point to each number, beginning with 0, say the number, and then have your child repeat the number name. Do this to help him learn to identify the number by sight so that he will understand what number is being written. 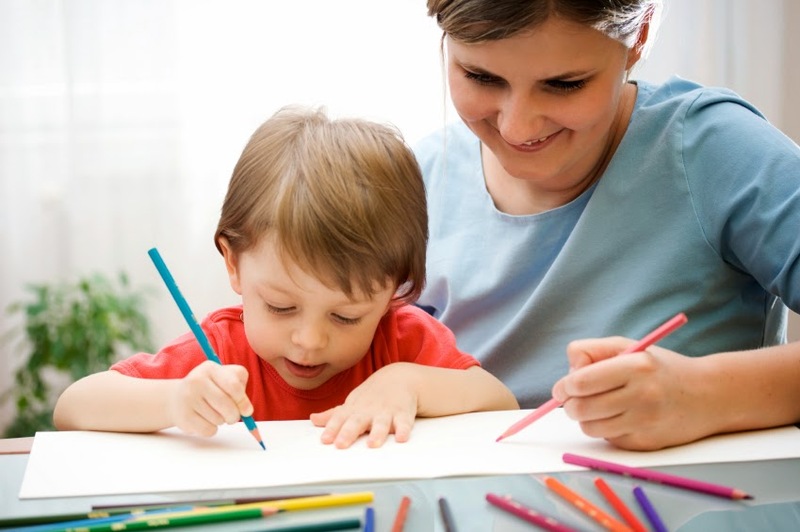 Give pencils and blank white paper to your child. Point to a number on the number chart and ask your child to tell you what number it is. Ask your child if you can write the number on the paper. Practice this activity when your child is first learning to write her numbers, knowing size does not matter, and the shape will not be perfect. Guide child if need be using your own hand to help as holds the pencil. Decide how many numbers you want to start with. For numbers, its easy to start with 1-10.Teach one number at a time and do not proceed to the next number until your child has mastered the current number.First ,Give Your Child a large Number on a piece of paper. Have him fill it with objects. Writing number worksheets are an excellent resource for your child to start counting number,learning number writing practice.In worksheet on the first page draw the first number (0-9). Be sure the number is large enough for your child to copy or trace, but not so large that it takes up too much space on the page. 1. Mom help to her child hold the Pencil to write Number.